When we think of paddlewheel steamboats, most of us picture the great Mississippi River boats. Mark Twain formed the mental picture most of us envision. Or we think of "Fulton's Folly" churning the waters of the Hudson. But the paddlewheelers played a major part in the economic development of Jacksonville. The sidewheeler City of Jacksonville. The story of St. Johns River paddlewheelers is a story of adventure in an area of the transportation business involving hazard, fantastic profit -- and intense competition. This paper examines the impact of early steamboats on the St Johns River by looking at parallels between the life story of one successful riverboat captain and the overall history of the business. 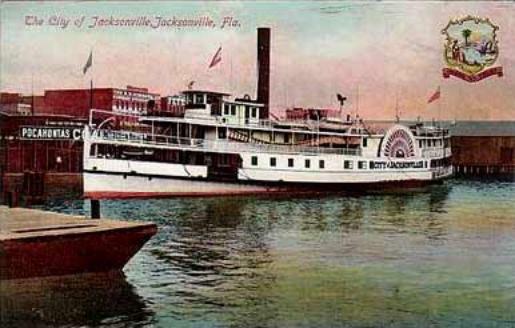 Captain Jacob Brock initiated the first regularly scheduled runs between Jacksonville and Enterprise ushering in the golden age of St. Johns River steamboats. His story is their story. "How do you get to Enterprise, Florida?" asks a voice from the back of the room. You reply, "Why that's easy -- from Jacksonville, just take Interstate 95 south to Interstate 4 west, follow that until you get to exit 53. That will take you to Enterprise". "But what if there were no Interstate 95?" asks the voice from the back. "You could follow U.S. 17 south." "But what if there were no U.S. 17? What if there were no roads at all?" There was a time when there was only one "highway" -- a dirt track for ox carts, really -- anywhere on Florida's east coast. So, how did people get around in those early days? How did plantations get outside supplies? How did farmers ship their produce to market? In 1807 Robert Fulton successfully inserted a steam engine into a boat, the Clermont, to drive huge paddlewheels on either side of the boat. "Fulton's Folly", as detractors called the project, changed the world. 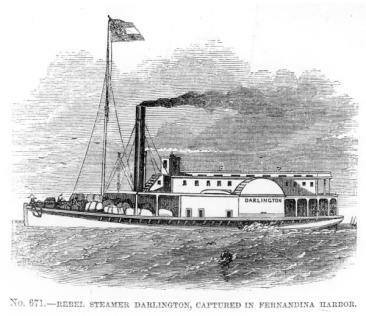 The steamboat ruled America in transportation till the development of reliable railroads. But the paddlewheelers came first and they played a major part in the economic development of Florida. 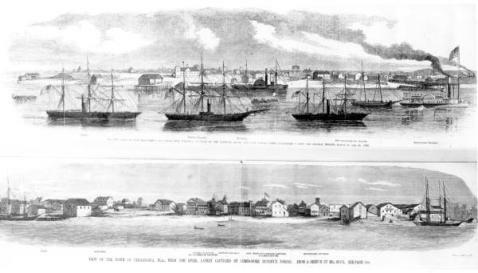 By the end of the Civil War, Jacksonville had developed three primary industries: lumbering, tourism and exporting produce, especially oranges; although there was some overlapping, each type of industry normally called for its own type of ship. Thus, three main types of commercial vessels plied the St. Johns: the schooner, the side-wheeler and the stern-wheeler. Schooners were sailing ships with a fore and aft rig, i.e. the masts and sails were in a line down the length of the vessel; they were especially good at carrying bulky cargo. Side-wheelers were steamers with two paddle wheels located on each side admidships; they were usually employed as ocean-going vessels for both passengers and cargo. Most tourists arrived in Jacksonville from the north aboard side-wheelers. Stern-wheelers were steamers driven by one huge paddlewheel pushing the vessel from the rear; these shallow-draft vessels were good to maneuver in the relatively calm waters of inland rivers to bring produce from inland farms to the port. "You should not be surprised when getting aboard," he wrote, "To see a 12 foot alligator tired down on a 12 foot board" lashed to the deck. Oskey's, a store which catered to tourists wanting souvenirs of Florida, bought gators to transform them into handbags, shoes, belts, or suitcases. Other deck cargo included wicker baskets of bread from the Rosenbush Bakery in Green Cove Springs, crates of live chickens (which sold for 50¢ each while eggs sold for 10¢ a dozen) tied-up pigs, and even hobbled horses or cattle. These cows sold for $18 per head. All these details that Maierfeldt remembered came toward the end of the Steamboat Era, but how did this fascinating facet of the transportation industry get started on the St. Johns in the first place? Captain Jacob Brock was largely responsible. In the fall of 1853, Captain Brock brought something new to the Florida territory -- regularly scheduled steamboat trips up the St. Johns River. He built a business transporting tourists and hunters up river aboard one of his several steamboats. Riverboating was a difficult business. In spite of thick water weeds, snakes and gators, Captain Brock saw a future for steamboating in Florida. He envisioned taking tourists and goods to the interior and bringing produce out. 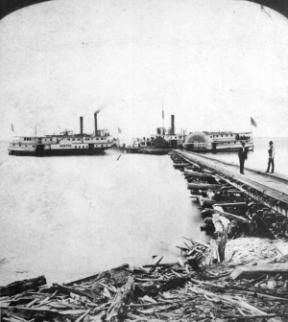 In 1854, Brock ran the Darlington between Jacksonville and Palatka initially, but soon expanded service to Enterprise, where the water became too shallow for further navigation. How could he make a fortune after a start of transporting that first meager cargo? What attraction made guests willing to sleep on a pool table and think it luxury? I write you from the Southern extremity of steam navigation on the St. John's river. We have taken a long journey from its mouth to get here, about 300 miles, but are already richly repaid for our trouble. L.N. goes on to describe hanging festoons of Spanish moss draped from lofty branches, neat pretty cottages buried amid flowering foliage, winding paths of white sand through openings of soft green turf, fragrant flowering shrubs, a vine of yellow jasmine climbing over a tall tree and scattering its bright blossoms like stars on the ground, and the "delicate sensitive briar"! "Did you ever imagine how delightful it is to go South and meet Spring, passing from the cold and frosty air of a northern latitude, the raw winds and the damp snowy sensation...?" "The hole of the Hattie Brock can contain 800 bales of cotton. She has cabins to accommodate from 75 to 100 passengers, an excellent double engine, nearly new, and cost about $20,000. She was the best boat ever built expressly for the St. Johns trade"
Union troops commanded by Captain S.F. DuPont, chairman of the Blockade Strategy Board, arrived by ship in Fernandina just as Confederate troops were withdrawing from the city overland by train. The railroad tracks ran in a two-mile stretch immediately parallel to the Amelia River before crossing a railroad trestle. DuPont dispatched the USS Ottawa, a shallow-draft gunboat, to blow up the trestle before the train could cross it. 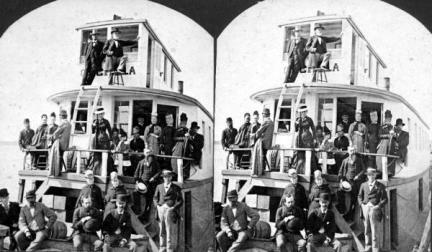 The gunboat and the train loaded with Confederate troops and civilian passengers raced for the bridge. Where the rails ran close to the river, the gunboat opened fire on the train. Soon every window on the train bristled with rifle barrels as the Confederates returned fire spattering the deck of the Ottawa with hot lead. A lucky shot from an Ottawa cannon burst in the last car of the train killing two passengers and disabling the car, which was loaded with furniture from the homes of fleeing civilians. Quickly the trainmen released the damaged car and abandoned it on the tracks. Freed from the disabled car, the Confederate train raced across the bridge to safety. To help with the evacuation of Fernandina, Captain Jacob Brock had packed every square inch of the Darlington with "military supplies, wagons, mules, forage and as many women and children as he could carry." As the Ottawa chased the train, Captain Brock raced the Darlington for the same bridge. The vertical clearance for the bridge was so low that the large yankee gunboat could not pass; but Captain Brock had traveled through the channel often enough that he knew how to get his smaller steamer under the bridge. 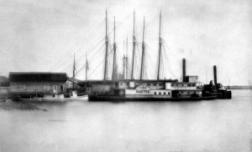 Seeing both the Confederate train and the Darlington headed for escape trying to save the Confederate supplies and household goods, the Commander R. P. Rogers launched two armed smaller boats from the Ottawa in full pursuit of Captain Brock. 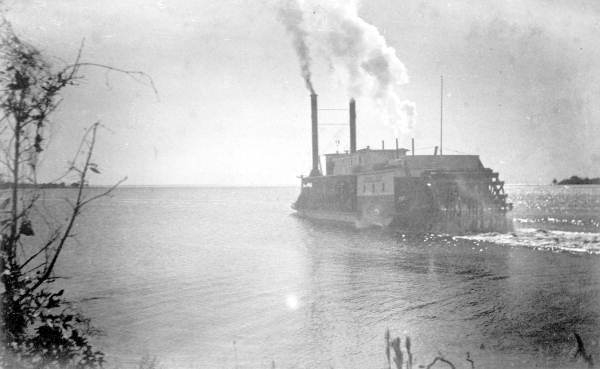 During the war, most steamboats on the river were Federal ones carrying troops on invasions. How did the Yankees use Brock's ship? Brock got both of his boats, Darlington and Hattie Brock, back. Brock expanded his operations in several areas related to riverboating. This may not have been a very profitable contract. 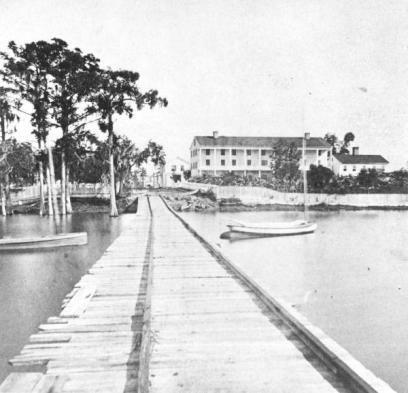 On March 26, 1866, Major Arthur Williams, who supervised the move of patients in the Freedmen's Bureau Hospital from Jacksonville to Magnolia, demanded of the hospital board that the hospital get its own river boat. He pointed out that roads were inadequate, too rough for the transportation of sick people by horse and wagon, and that ordering supplies by land was inefficient. The board was not willing to buy a boat but instead contracted with Captain Brock's Darlington for the service. But even then, the board would not pay transportation expenses for new incoming patients -- only for discharged ones! Thrift bordering on stinginess characterized the hospital board; when a surgeon requested that hospital gowns be ordered from Jacksonville, the board insisted that he order bolts of cloth and either employ seamstresses or have female patients sew their own. Brock also resumed his hotel business. But the war had hurt; yankee looters had stripped Brock's hotel to a ghost of its former self. A female guest in 1867 complained, "The Brock House... is filled with invalids mostly, consumptives who find this climate unrivaled for pulmonary disease, dry and hot..."
Another border gripped, "This house is quite primitive, no carpets, curtains nor luxuries, but when out doors is so charming you can wink at the discomforts inside... where passengers left the steamboat to make merry (in the hotel bar)..."
But Captain Brock's hotel eventually did regain its former status and popularity. The guest list at Brock House came to include such notables as President Ulysses Grant, President Grover Cleveland, General William Sherman and William Jennings Bryan. Not only yankees but even foreigners from England, France and South Africa came to Brock House. But as Brock's business grew more competition entered the river. He did not lack customers; tourists flocked to north Florida. What was the attraction for them? The profits the Brock Line earned attracted the attention of competitors; other riverboats appeared on the river: Starlight, City Point, Dictator and others. Brock responded to the competition by adding another vessel to his line, the Florence. The Florence, built in Wilminton, Delaware, was 176 net and 263 gross tons. She measured 135 feet long and 24.4 feet wide with a cargo hole of 6.8 feet. Brock's son, Charles, captained the Florence. To finance the Florence Brock mortgaged the Brock House and 323 acres of land in Enterprise to the shipbuilders. And a few months later, he borrowed money, using the Darlington and the Hattie Brock as collateral, to buy out his northern partners. Competition increased even more as more and more entrepreneurs saw the profits to be made in the St. Johns riverboat business. 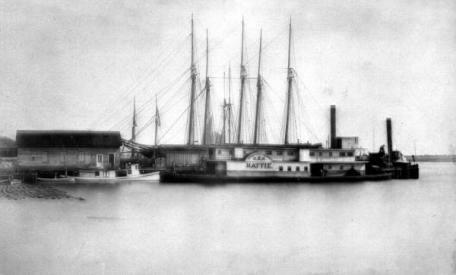 Brock responded to his competitors by beginning to build his own schooner, planning to expand his operations by entering the lumber transport aspect of the business... but tourism remained the backbone of his efforts. Brock placed even greater emphasis on his own excursion business. What was a trip on one of Brock's riverboats like? Not all trips went so well. On the Fourth Of July that same year, the St. Johns Shooting Club "patriotically moved and socially inclined" rode the Florence to Mayport and a short way out into the ocean. Dinner was announced and the hungry crowd sat down to the well spread table. Hardly through the first course and well on to the second course when the steamer struck the first heavy swell. All smiled languidly and looked brave and one ferocious member of the club who had traveled called vigorously for the coconut pie. It was no use, swells succeeded, lips grew white and even brave shooting men... had sudden business with the captain. After pitching and rolling for some few minutes and the rain coming down not hard but persistently, the south beach and surf bathing was abandoned and a return to Mayport voted. But the day was not a total loss; on their return to Jacksonville, the passengers enjoyed watching fireworks over the city from the deck of the Florence. Other riverboat lines vied for the excursion business. To tow damaged riverboats to his ship repair yard, Brock also added a tug, the R.L. Mabey, to his fleet. Still dependent mostly on the excursion business, Brock began to offer special rates to groups as diverse as Episcopal Church Women, the -- wet -- Volunteer Fighters, and the --dry -- Sons Of Temperance. He also initiated special cruises for all-black groups. He even tried consolidating with a rival line. His vision of the future came too late. In May of 1877 Captain Brock declared voluntary bankruptcy. At public auction, the David Clark sold for $20,000; the Robert G. Reiman, a Brock tug, sold for $1,000; the under-construction schooner went for $5,000. 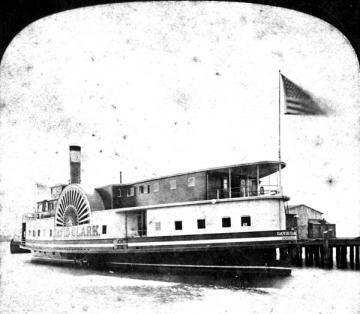 But the queen of the fleet, the Florence, was purchased by Captain Brock's son, Charles, for $14,000 (Charles Brock continued to operated river boats on the St. Johns till 1904). Tis but a few years since the question of a tour of the splendid natural domain described in the foregoing pages, via the great highway of the peninsula, the broad and forested environed St. Johns river, presented so many obstacles that but comparatively few travelers had the courage to invade the vast reaches of territory tributary to and accessible by the river. Now it is the exceptional visitor to Jacksonville who fails to enjoy the round trip to Enterprise and return. In those days the boats running without definite schedule, stopping for vexatious hours at minor landings for freight -- their principal means of support; home-made steamers, small, cramped and hot, with fare suggestive of the primitive 'grub' of the mining camp, and beds about the dimensions of a poor-house coffin; such were the craft the travelers found upon the upper St. Johns river. Ten years after Brock's death, the St. Johns and Halifax Railroad reached Daytona. And the Jacksonville, Tampa & Key West Railroad soon reached Sanford where it connected with roads extending South and West. But what of the paddlewheelers? What happened to them? 01. James C. Craig, "Steamboating Days." In Papers Of The Jacksonville Historical Society Vol. III (1959), page 141. 02. Frederick T.Davis, History Of Jacksonville, Florida, And Vicinity, 1513 to 1924. (Jacksonville: San Marco Bookstore. Original copyright, 1925), p. 366. 03. John W. Cowart, "Paddlewheeler, passengers met disaster on St. Johns." in Florida Times-Union Nov. 8, 1982. 04. Ianthe Bond Hebel, Centennial History Of Volusia County, Florida 1854 - 1954, (Daytona Beach, Fla.: College Publishing Co. c. 1955), p. 13. 06. Frank Donovan, River Boats Of America, ( New York: Thomas Y. Crowell Co. c. 1966), p. 12. 10. Davis, p. 358 and Donovan p. 13. 13. William C. Maierfeldt, Early Days In Orange Park, ( 30 page self-published booklet; no copyright) pp. 5-6. 18. Mueller, Steamboating On The St. Johns, p. 59. 19. Mueller, Steamboating On The St. Johns, p. 51. 20. Mueller, Steamboating On The St. Johns, p. 51. 22. Mueller, Steamboating On The St. Johns, p. 52. 24. Mueller, Steamboating On The St. Johns, p. 52. 25. Mueller, Steamboating On The St. Johns, p. 54. 26. Mueller, Steamboating On The St. Johns, p. 52. 27. Floyd and Marion Rinhart, Victorian Florida: America's Last Frontier, (Atlanta, Ga.: Peachtree Publishers Limited. c. 1986), p. 56. 28. Mueller, Steamboating On The St. Johns, p. 53. 29. Mueller, Steamboating On The St. Johns, p. 29 - 30. 30. Mueller, Steamboating On The St. Johns, p. 30 - 31. 31. Mueller, Steamboating On The St. Johns, p. 56. 34. Mueller, Steamboating On The St. Johns, p. 54. 37. Mueller, Steamboating On The St. Johns, p. 56. 38. Mueller, Steamboating On The St. Johns, p. 55. 39. Mueller, Steamboating On The St. Johns, p. 55. 40. James Robertson Ward, Old Hickory's Town, (Jacksonville, Fla.: Florida Publishing Co. c. 1982), p. 142. 41. Pleasant Daniel Gold, History Of Duval County, ( St. Augustine, Fla.: The Record Co. c. 1928), p. 145. 42. Richard A. Martin, The City Makers, (Jacksonville, Fla.: Convention Press Inc. c. 1972), p. 49. 44. Mueller, Steamboating On The St. Johns, p. 56. 46. Arch Fredric Blakey, Parade Of Memories: A History Of Clay County, Florida, (Jacksonville, Fla.: Published for the Clay County Board of County Commissioners by Drummond Press. c. 1976), p. 125. 48. Blakey, pp. 115 - 117. 49. Mueller, Steamboating On The St. Johns, p. 57. 50. Mueller, Steamboating On The St. Johns, p. 59. 51. Mueller, Steamboating On The St. Johns, p. 58. 54. Mueller, Steamboating On The St. Johns, p. 57. 56. Mueller, Steamboating On The St. Johns, p. 58. 59. 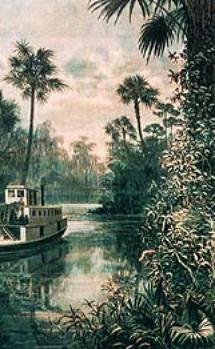 Edward A. Mueller, St. Johns River Steamboats. (Jacksonville, Fla.: Privately published by Mendelson Press. c. 1986) p.112 - 113. 60. Mueller, St. Johns River Steamboats, p. 115. 61. Mueller, Steamboating On The St. Johns, p. 61. 62. Mueller, Steamboating On The St. Johns, p. 60. 63. Mueller, Steamboating On The St. Johns, p. 58-60. 64. Mueller, Steamboating On The St. Johns, p. 60. 65. Mueller, Steamboating On The St. Johns, p. 61. 66. Mueller, Steamboating On The St. Johns, p. 61. 67. Mueller, Steamboating On The St. Johns, p. 62. 68. Mueller, Steamboating On The St. Johns, p. 81. Blakey, Arch Fredric. Parade Of Memories: A History Of Clay County, Florida. Jacksonville, Fla.: Published for the Clay County Board of County Commissioners by Drummond Press. c. 1976. 311 pages. Index. Buker, George E. Jacksonville: Riverport -- Seaport. Columbia, S.C.: University of South Carolina Press. c. 1992. 192 pages. Index. 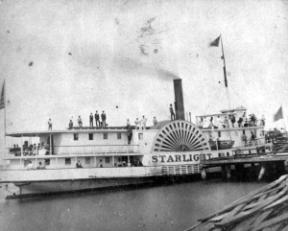 Cowart, John W. "Paddlewheeler, passengers met disaster on St. Johns." Florida Times-Union Nov. 8, 1982. Craig, James C. "Steamboating Days." In Papers Of The Jacksonville Historical Society Vol. III (1959), pages 138 -145. Davis, T Frederick. 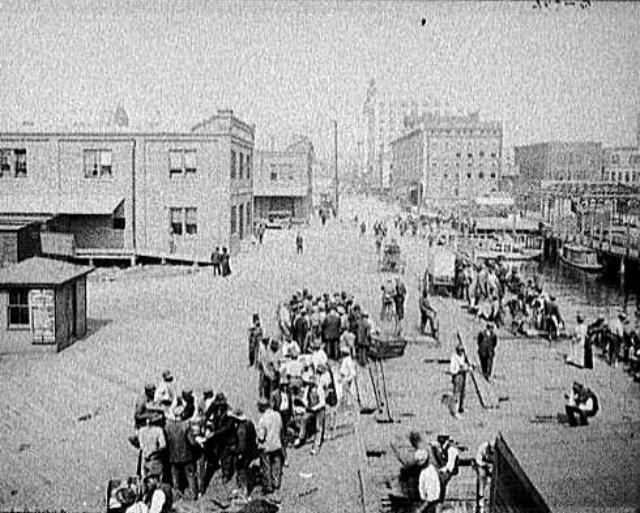 History Of Jacksonville, Florida, And Vicinity, 1513 to 1924. 1990 Reprint. Jacksonville: San Marco Bookstore. Original copyright, 1925. 513 pages. Index. Donovan, Frank. River Boats Of America. New York: Thomas Y. Crowell Co. c. 1966. 298 pages. Index. Gold, Pleasant Daniel. History Of Duval County. St. Augustine, Fla.: The Record Co. c. 1928. 234 pages. Index. Hebel, Ianthe Bond. Centennial History Of Volusia County, Florida 1854 - 1954. Daytona Beach, Fla.: College Publishing Co. c. 1955. 205 pages. Index. Maierfeldt, William C. Early Days In Orange Park. 30 page self-published booklet; no copyright. Martin, Richard A. The City Makers. Jacksonville, Fla.: Convention Press Inc. c. 1972. 334 pages. Index. 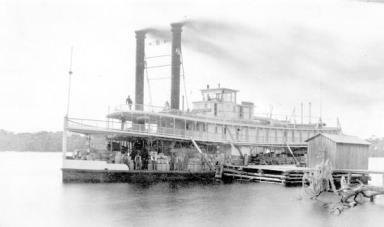 Mueller, Edward A. St. Johns River Steamboats. Jacksonville, Fla.: Privately published by Mendelson Press. c. 1986. 219 pages. No index. Mueller, Edward A. Steamboating On The St. Johns. Melbourne, Fla. Published by the Kellersberger Fund of the South Brevard Historical Society. c. 1980. 124 pages. No index. Rinhart, Floyd and Marion. Victorian Florida: America's Last Frontier. Atlanta, Ga.: Peachtree Publishers Limited. c. 1986.223 pages. Index. 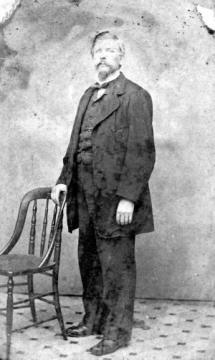 Ward, James Robertson. Old Hickory's Town. Jacksonville, Fla.: Florida Publishing Co. c. 1982. 256 pages. Index.